This e-commerce terms and conditions template is ideal for most online shops. Whether you are a start-up specialising in small range of niche products or a well established company selling thousands of product lines, this template can be easily customised to suit your requirements. These e-commerce terms and conditions are suitable for most online retailers. The exact type of product does not matter provided that it is physical (rather than downloaded). This template could be used by businesses that sell headphones, computer hardware, clothing, comic books and many other products. Although we give you many options, the template is easy to edit to suit your business. trade safely internationally, whether your customers are in New Zealand, Australia, EU or further afield. Are these terms and conditions suitable for your business? If you are able to identify your business by reading the points below, then this template should be suitable for you. We also list similar alternatives afterwards. These T&C are suitable for businesses of all sizes. You may be a newly started sole trader with a single product or an established company selling thousands of different product lines. services in addition to products. on a pre-arranged credit account. or, the customer may pick up the product from your premises. Delivery could be in a single instalment or in multiple instalments. Website terms and conditions template: international sale of goods to business is suitable for a retailer, wholesaler or manufacturer that sells goods to businesses only. It doesn't include the consumer protection provisions that this template does. 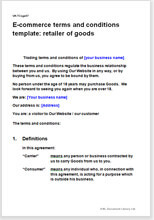 Website terms and conditions template: retail of hardware and licensed software is suitable for a business that sells products that use software developed or owned by the seller.This template is likely to be suitable for a manufacturer of an electronic product sells directly to end customers, or for a software house sells third party products with their software. Website terms and conditions template: retail of sourced or made to order products is suitable for a retailer who sources, creates or customises some products to a specification given by customers. For example, you may sell customised greetings cards, or source rare wine, or make made to measure suits. Website terms and conditions template: retailer of goods part designed by site visitors is suitable for a business that sells products that have been designed by site visitors. For example, site visitors may contribute their own artwork to be printed on products (such as clothing) in return for a royalty or free product. We assume that you do not sell to distributors or wholesalers or retailers. If you do, you will need different terms on delivery, risk, retention of title (ownership) and return. See our sales agency agreements. We also have a large range of website terms and conditions templates suitable for other businesses. If you are in any doubt as to which template you should choose, please contact us. The law in these T&C is largely common law that deals with the basics of contracts: offer, acceptance, price and payment, delivery, returns, dispute resolution, liabilities and risk. Provided you comply with the law, you can set the terms you like. The terms and conditions are valid for businesses based anywhere in New Zealand. This template complies with the Contract and Commercial Law Act 2017, the Fair Trading Act 1986, the Consumer Guarantees Act 1993 as amended, and other latest consumer protection legislation allowing you to sell to businesses or consumers. Other miscellaneous legal provisions to protect you (warranties, exclusions, indemnities etc). This document was written by a solicitor for Net Lawman. It complies with current New Zealand law. "I have found Net Lawman perfect for my needs and saved me thousand of dollars in legal fees getting a lawyer to produce these douc's from scratch. I have used three of the Net Lawman doc's to basically write up the NDA, contract, Non Solicitation agreements to a level of being 95% complete and then used my lawyer to sign off. My lawyer even commented how complete these doc's are. "I found the documents easy to use and great value. I feel the service is easy to use and good value for money"